I’m back from my trip but keen to be off again. The Brompton performed well: no punctures. However, while the front tyre is in good condition, the back one – newer and a Schwalbe – has lost its tread & I suppose needs replacing: is that normal? I spent 7 days on the bike. Compared to last summer’s ride from Rotterdam to Berlin(730 km in 7 days) I covered less (585 km). But last year I had almost continuous heavy rain and I thought the best use of the time then was to keep pounding away and at least get some distance done, while apart from a couple of hours one day when I had to put rain gear on, this time I had dry, sunny weather and an inclination to do some sightseeing – and sometimes take a lengthy lunch break. I made it to Russia! At least I reached the Russian enclave of Kaliningrad and its capital, confusingly also named Kaliningrad, enclosed by Poland, Lithuania and the Baltic Sea. It’s still all but 1000 km to St Petersburg. I shall allow myself one rant – to do with transporting the bike. I booked an Easy Jet return flight from Gatwick to Berlin, planning to return to Berlin by bus or train after finishing the ride. The airline imposes an extra charge of £25 each way for the bike: fair enough. It also says the bike has to be bagged up – so in it goes into the Brompton Bag. But what to do with the damned bulky bag at the other end? I can’t take it with me. In the absence of a friend living conveniently near the airport, I had researched the left-luggage situation. There were lockers at the airport – in a multi-storey carpark outside the terminal – and at Berlin railway station. Since I only later discovered the station lockers allowed you to leave things for a mere 72 hours, it was fortunate I decided to use an airport locker on arrival – you could leave your stuff there for a month. The locker costs 4 euros for 24 hours: for the 11-day trip (I broke the journey back toBerlinwith a stop inGdanskto meet Sonia and Rob on holiday there) this would mean 44 euros – nearly 40 quid – rather pricey, but unavoidable. I carefully saved up the required coins during the time I was inGermany- the lockers took nothing else. Imagine my horror on arriving back at the airport after a long and poorly connected train journey from Gdansk [and time to the flight running short] to discover the infernal machine demanding not 44 but 56 euros (around 50 quid) – more than I had in cash, with no person on hand to query the amount, and with no means of obtaining coins near the lockers. So I hared back to the terminal (the bike serving me well), begged to change notes for further coins from an unwilling grump of a money-changer (nothing in it for him), and sped back finally to release the bag. I made the flight. But I can do without extortionate monopolists hiding facelessly behind mere automatons, saying in effect “take it or leave it”. I had little option but to take it.Enough rant. This was a splendid excursion. I had to keep reminding myself that the whole journey through Poland and into the Russian enclave was through what had for centuries been either the eastern part of Prussia or heavily populated by Teutons, because once over the post-war imposed former GDR-Polish border on the River Oder, all signs of a former German past have been almost completely obliterated – not just because of the war but later deliberately – as a warm-up before I left England I watched Polanski’s The Pianist. Geo-political landmarks were a significant feature of this trip. But the landscape was pleasant – almost wholly flat, but with many lakes and woods. And no dead dogs. Accommodation was easy. There were hotels in all the towns through Poland. I paid an average of about £25 a room a night My one night in Kaliningrad cost £50, but that’s reasonable compared to St Petersburg and Moscow. Meals and beer are cheap. The lock for the bike was detected in my hand luggage in the airport scan on the way back, but as I never use it – I never leave the bike anywhere outside – and it’s a hefty part of the weight in my luggage, I shan’t take it next time. In the event I could have managed without the pump as well (it is of course only light-weight) but tweaked the tyres a couple of times for appearance’s sake. Day 1. Tues 5th July:Berlin to Seelow. 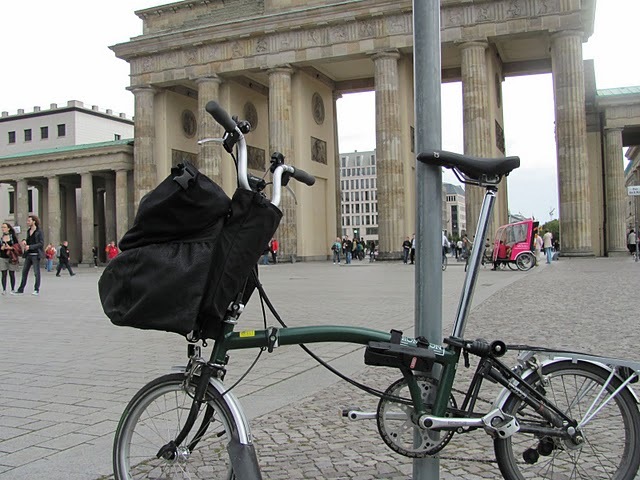 I overnight off the Kurfuerstendamm in the former West Berlin and cycle across the city centre, over the Potsdamer Platz’s markers showing where the Wall used to be, to my starting point, the Brandenburg Gate. There are lots of cyclists – helmet-less – and a fair number of marked cycleways – otherwise it’s road or pavement. I ride out through Unter den Linden, heading east and for the road out to where I want to cross into Poland. I miss my way for a while in the suburbs and lose a bit of time. As squeaking noises emanate from I know not what part of the bike, I stop at a bike shop and buy a small can of grease. I’m told I should wipe the grease off after applying it. I can’t see the point and don’t. At the first small town outside Berlin, Muencheberg, I stop at a cafe for an icecream and coffee and a chat with the proprietor. She rewards me with the gift of a map of the local area. I now learn it’s known as Maerkische Schweiz, or “March (i.e. borderland) Switzerland”, optimistically, as there are no mountains, merely low hills, though there are lakes with bathing beaches, and forests. On to Seelow, the last town in the former GDR – hence its Soviet-era monumentalist war memorial half way down the town’s hill – (and so disrupting my long downhill. TheBattle for the Seelow Heights was the Germans’ last major stand before Berlin. 30,000 Soviets died in 4 days. Most of the route today was on a dedicated cycle track along the main road, but at a couple of points this alarmingly disappeared and there was no alternative but to take the plunge for a couple of miles along the road – narrow, hard-shoulderless, barriered, and with speeding traffic. There were also long stretches of cobblestones. I walked. 72 km for the day (plus meanderings). Day 2. Wed. 6th July: Seelow to Strzelce Krajenskie – 95 km. From Seelow, it’s 20 km to the Polish border. As I approach it, a sign informs cyclists they are now on the R1 (also know as the E1) – an “official” route picked out from Calais all the way to St Petersburg. From now on, I am to be on this route for part of the way, but won’t stick to it as it zigzags about too much. The border, at the divided town of Kuestrin/ Kostrzyn, marked by an island in the middle of the River Oder, is now a tame affair with no controls and derelict checkpoints. Up until 1991, it was manned by Soviet soldiers and locals were scared to go anywhere near it – even though it separated two friendly countries. Just inside Poland– there were adverts local “night clubs”. Similar hoardings for local brothels are, I recall, the first sight to greet the walker from Germany into the Czech Republic at As. Further on I see the first of several storks’ nests. They’re on telegraph poles and the roofs of houses in the middle of villages. Soon the very antithesis of the Soviet glorification of the(ir own) dead encountered only a few miles back inside Germany. A sign in an overgrown park marking, in Polish and (adding insult?) misspelled German, the “site of the former German cemetery”. In the post-war fury, they even took out the graves. Towards the end of the day I am excited to see the first sign to Grzechotki – the Polish side of the border with Russia: only 394 km to go! Day 3. Thur 7th July: Strzelce Krajenskie to Walcz – 78 km. All the way to the Russian border, I shall be on the same main road – the most direct route – pedalling along the usually narrow hard shoulder which sometimes disappears, but vehicles overwhelmingly keep their distance. I stupidly carry on riding when I can see a pothole-filling lorry a couple of hundred yards in front of me. I then have to stop and brush off the gravel encrusting the tyres – no lasting damage. I pass through the village ofSzczuczarz. Day 4 Fri 8th July: Walcz to Chojnice – 91 km. For the first and only time I don my waterproof jacket for the afternoon. Day 5 Sat 9th July: Chojnice to Malbork – 113 km. Long day today, to leave time free next morning to gape at the massive Gothic brick castle of Malbork – the biggest in Europe. But convenient stops for lunch at Czersk and cake and coffee at Starogard Gdanski. I am now within a short day’s ride ofGdanskif I was going there. An hour before Malbork I pass over another landmark, the River Vistula. Into Malbork over the River Nogat, the castle russet in the evening sunshine. At the practically deserted modern hotel in Malbork, the informative waiter speaks some English and says he is also a student at the police college. He says I should be very careful around the Russian border as there are problems with smugglers. Quite how this might affect me he can’t explain. Day 6. Sun 10th July: Malbork to Braniewo – 73 km. Malbork Castle duly viewed – from outside – in amazement, and a gentle afternoon ride in prospect along the quiet partly sea-side route to the last town inPoland. A violent low thunderstorm intervenes at about 2 pm. But I’ve just arrived in the centre of the sizeable town of Elblag and sit it out over a large lunch. On then along a quiet road to my first sight of the sea – the Baltic – since the English channel. A Xenophon moment: “thalassa”. This happens just before I stumble on the town ofFrombork. I hadn’t done much homework. It’s where Copernicus lived and worked and there’s a tall statue of him in front of a vast cathedral – yet another huge building in these parts, such as you view with wonder in, say, Bruges or Ghent. I overnight in Braniewo relishing the prospect of crossing the Russian border in the morning. Day 7 Mon 11th July: Braniewo to the city of Kaliningrad- 63 km. It’s a brisk 7 km ride to the Russian border and there’s a series of checkpoints before I’m free to roam in Russia. As I wait at a level crossing, I’m joined by 2 other cyclists – from Sweden andNorway- who are riding from Gdansk to Riga. They are in their thirties with families, but have snatched a few days off. They have applied for 72-hour visas, which are supposed to be waiting for them at the border, but they are not sure. We ride on together. They have rucksacks, not panniers. They say they can ride faster. We jump the short queue of cars – what a satisfying feeling – to get to the first Polish barrier, and on showing our passports are waved straight on. At the next point they take more time and ask what we’re carrying. Then another first: a ride through no man’s land in a peloton. At the first of three Russian checkpoints, we have to fill in forms before going on to the next point. The officials are affable and helpful, and joke that they want their pen back. The lads’ visas are waiting as promised. We ride on to the next point, where we are greeted by a snarling Alsatian – chained to its kennel. Our documents are taken into a hutch and we wait, perhaps 15 minutes. As we sit in the sun a uniformed lady approaches with a spaniel and asks with a laugh if we have any drugs: the dog doesn’t think so. Suddenly we’re free to go. The third point is a wave round a barrier to waiting cars bound for Poland. Not a smuggler in sight. Clear of the border we take pictures, at a sign showing 1001 km to St Petersburg, and 1200 odd toMoscow. Our destination for the day, and my final stop – the city of Kaliningrad- is 49 km away, along an almost traffic-free road offering glimpses to the left of the Baltic and, out to sea, a parallel spit of land emanating east of Gdansk. But I want to stop at the first village, Mamonovo, to buy roubles and fruit juice and they want to press on – and anyway they’ll probably want to go a little faster than me – so we part company. A startling sight on the way out from the village – a long bright green yellow-headed snake serpentining its way into bushes. I fluff getting the camera out in time, but no kidding: it was several feet long. Still no smugglers. The road from the suburbs into the centre of the city is pretty uncycleable – heavy belching traffic (Soviet-era pollution, here we come) on cobblestones, and cracked pavements – but I reach the biggest hotel – the Hotel Kaliningrad – towering at the top of the main drag at 5 pm. In the large, swanky lobby, my by now filthy folded bike attracts admiring attention. No sign of the notorious Kaliningrad mafia. They do have a room for me.